Opening with the prophet Elijah's ascent into heaven and closing with the people of Judah's descent to Babylonia, 2 Kings charts the story of the two Israelite kingdoms until their destruction. This commentary unfolds the literary dimensions of 2 Kings, analyzes the strategies through which its words create a world of meaning, and examines the book's tales of prophets, political intrigue, royal apostasy, and religious reform as components of larger patterns. 2 Kings pays attention to the writers' methods of representing human character and of twisting chronological time for literary purposes. It also shows how the contests between kings and prophets are mirrored in the competing structures of regnal synchronization and prophecy-fulfillment. 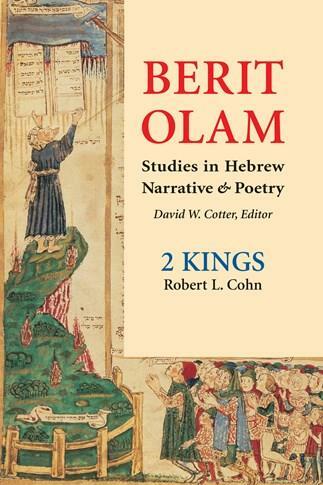 Much more than a common chronicle of royal achievements and disasters, 2 Kings emerges as a powerful history that creates memories and forges identities for its Jewish readers. 2 Kings is divided into four parts including Part One "The Story of Elisha: 2 Kings 1:1-8:6"; Part Two "Revolutions in Aram, Israel, and Judah: 2 Kings 8:7-13:25"; Part Three "Turmoil and Tragedy for Israel: 2 Kings 14-17"; and Part Four "Renewal and Catastrophe for Judah: 2 Kings 18-25." Robert L. Cohn is professor of religion and holds the Philip and Muriel Berman Chair in Jewish studies at Lafayette College. Under the auspices of the American Jewish Committee, he lectured on Jewish interpretations of the Bible as the first American Jewish-scholar-in-residence at four Roman Catholic seminaries in Poland.